Warm Mix Asphalt is an asphalt that is produced and applied at a temperature around 20 – 40 °C lower than an equivalent “Hot Mix Asphalt” (HMA). The information on this website focuses on Warm Mix Asphalt (WMA) technologies for producing asphalt at temperatures slightly above 100 °C with properties or performance equivalent to that of conventional HMA. Manufacturing and paving benefits: less hardening of the bitumen and WMA is fully compatible with the use of RAP. Paving operations benefits: WMA can be compacted at a lower temperature than HMA; producing WMA at HMA temperatures will permit an extended time for haulage and compaction. WMA will cool faster to ambient temperatures and therefore, the site can be opened for traffic at an earlier stage. The lower emissions support the goal of the European asphalt industry to reduce bitumen fumes during paving operations. There are various techniques available to produce this Warm Mix Asphalt. More information can also be found in the EAPA Position Paper “The use of Warm Mix Asphalt” which can be downloaded by clicking here. The first WMA techniques were developed in the late 1990’s. Additives were trialled in Germany and in Norway the WAM-Foam® process was developed. Cold mixes are produced with unheated aggregate and bitumen emulsion or foamed bitumen. 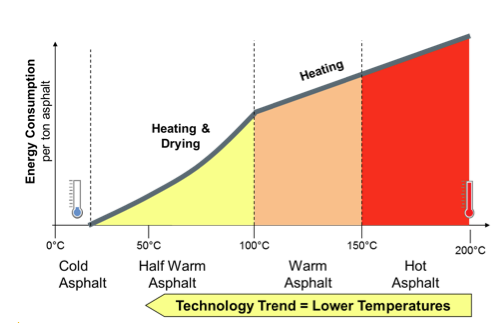 Half Warm Asphalt is produced between approximately 70 °C and roughly 100 °C. Warm Mix Asphalt is produced and mixed at temperatures roughly between 100 and 150 °C. Hot Mix Asphalt is produced and mixed at temperatures roughly between 120 and 190 °C The production temperatures of Hot Mix Asphalt depend on the bitumen used. The lower mixing and paving temperatures, obtained by the use of Warm Mix Asphalt, minimise fume and odour emissions and creates cooler working conditions for the asphalt workers. As a rule of thumb, the release of fume is reduced by around 50% for each 12 °C reduction in temperature. This reduction of emissions is the most important reason for the European asphalt industry to stimulate the use of Warm Mix Asphalt. Warm-Mix Asphalt (WMA) technologies operate above 100 oC, so the amount of water remaining in the mix is very small. Various techniques are used to reduce the effective viscosity of the binder enabling full coating and subsequent compactability at lower temperatures. Different organic additives can be used to lower the viscosity of the binder (bitumen) at temperatures above about 90°C. A commonly used additive is a special paraffin wax produced by conversion of natural gas. Organic additives typically give a temperature reduction of between 20–30 °C whilst they also improve the deformation resistance of asphalt so modified. Chemical additives do not change the bitumen viscosity. As surfactants they work at the microscopic interface of the aggregates and the bitumen. They regulate and reduce the frictional forces at that interface at a range of temperatures, typically between 140 and 85°C. It is therefore possible to mix the bitumen and aggregates and to compact the mixture at a lower temperature. Chemical additives may reduce the mix and compaction temperatures by about 20 – 40°C. A range of foaming techniques is applied to reduce the viscosity of bitumen. Various means are employed to introduce small amounts of water into the hot bitumen. The water turns to steam, increases the volume of the bitumen and reduces its viscosity for a short period. The expansion of the bitumen allows the coating of the aggregates at lower temperatures and the residual moisture supports the compaction of the asphalt on the construction site. 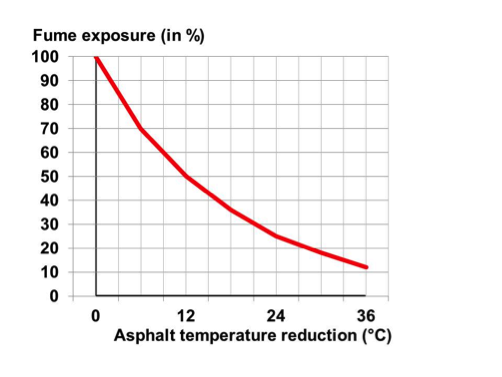 Production and paving temperatures can be reduced in parallel. 1. The direct method of foaming is to inject a small controlled amount of water to hot bitumen via foaming nozzles. This results in a large but temporary increase in the effective volume of the binder which facilitates coating at lower temperatures. Some vapour remains in the bitumen during compaction reducing effective viscosity and facilitating compaction. On cooling the binder reverts to normal, as the amount of water is insignificant. 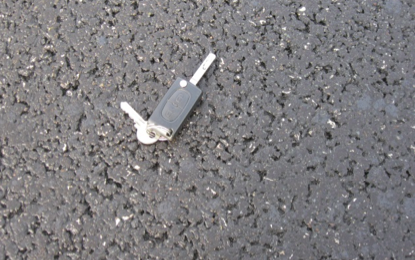 This technique can enable a temperature reduction of the asphalt mix of about 20 to 40°C. 2. An indirect foaming technique uses a mineral as the source of foaming water. Hydrophilic minerals from the zeolite family are commonly used. They contain about 20 percent of crystalline water, which is released above 100 °C. This release of water creates a controlled foaming effect, which can provide an improved workability for a 6- to 7-hour period, or until the temperature drops below 100 °C. The foaming results in an improved workability of the mix which can subsequently allow a decrease in the mix temperature by approximately 30°C with equivalent compaction performance. A second indirect foaming technique uses the moisture on the sand (or RAP) to generate naturally created foam. It is a sequential technique. The coarse aggregate which represents about 80% of the mix design is dried/heated to 130-160°C, it is then coated by the bitumen and thereby creating a thick binder film on the coarse particles. The next stage involves the addition of the cold/wet fraction. The moisture in contact with the hot bitumen causes foaming which facilitates easy coating of the cold and wet RAP or fine aggregate. This technique enables the same temperature reduction as the direct foaming through nozzles, about 20 to 40°C. Next to the above mentioned techniques there are also combined products that can be used to produce Warm Mix Asphalt, like pallets with fibres and zeolite or fibres with organic additives. Many studies show that the performance and the in-service characteristics of WMA mixes are equivalent to those of the traditional mixes, and frequently even better. The EAPA Position Paper “The use of Warm Mix Asphalt”, which can be downloaded by clicking here, gives a list of literature references of relevant studies. There are several reasons for the good performance of WMA. As a result of improved workability, a higher compacted density can be achieved. This higher density reduces the long-term in-service hardening of the bitumen and also prevents ingress of water. Lower production temperatures can also decrease the ageing of the bitumen during the production stage which can additionally improve the thermal and fatigue cracking resistance of the asphalt. In [2.] a review of field trials of WMA technologies conducted in various countries in the world is presented, with the emphasis on performance differences between WMA and conventional HMA. The most important benefit of using Warm Mix Asphalt is the significant lower bitumen fume exposure level during paving operations compared to Hot Mix Asphalt. This lower exposure level supports the goal of the European asphalt industry in reducing bitumen fumes during paving operations to improve the working environment of the asphalt workers. The second reason is the energy reduction; so lower the emission of greenhouse gases. The European asphalt industry strives to contribute to this and to initiate measures for emission reduction. The lower mixing and paving temperatures minimise fume and odour emissions and creates cooler working conditions for the asphalt workers. As a rule of thumb, the release of fume is reduced by around 50% for each 12 °C reduction in temperature. So a temperature reduction of 25 °C will lead to fume emission reduction of about 75% (see graph). This reduction of emissions is the most important reason for the European asphalt industry stimulating the use of Warm Mix Asphalt. Because of the lower production temperature of WMA less fuel is needed to heat the aggregate. This results in lower emissions of the asphalt plant. The actual reductions vary based on a number of factors and should be considered on a case by case basis. The lower mixing and paving temperatures help to minimise fumes, emissions, and odours and a subsequent reduction of workers’ potential for exposure to fugitive emissions from the plant. Lower asphalt temperatures results in less hardening of the bitumen/binder during manufacture. Lower production temperatures reduce the thermal stress on the plant components.WMA is fully compatible with the use of Reclaimed Asphalt. WMA is fully compatible with the use of RAP. For some technologies like foam, WMA can be compacted at a lower temperature than conventional HMA for an equivalent degree of compaction. Alternatively, producing WMA at HMA temperatures will permit an extended time for haulage and compaction. Therefore more distant sites can be served from each plant with the same degree of workability, or the period of workability to achieve the same degree of compaction is extended. Or, a higher degree of compaction can be achieved at the same (HMA) temperature. This can additionally extend the laying season into colder months and/or night working. WMA can be used in deep patches where the site is restricted. As the lower temperature WMA starts with less heat it will therefore cool faster to ambient temperatures. Therefore, the site can be opened for traffic at an earlier stage. WMA is important for paving operations in tunnels (and parking garages). It creates a more comfortable and better working environment for the asphalt workers. The European Standards for “Bituminous mixtures” (EN 13108-1 to -7) do not preclude the use of Warm Mix Asphalt. The European Standards include maximum temperatures for particular mixtures, but there are no minimum temperatures. The minimum temperature of the asphalt mix at delivery is declared by the manufacturer. The standards also contain provisions for dealing with mixtures containing additives, subject to demonstration of equivalent performance. Thus, European Standards should not be seen as a barrier to the introduction of WMA. Mixing asphalt at lower temperatures affects the whole production process. There are the changes of the process directly related to the WMA-technology applied (e.g. foam generator) and the other consequences or additional requirements that an asphalt plant needs to fulfil (e.g. operational range of burner). Details regarding the consequences for the asphalt plant when producing WMA can be found in the 2014 version of the EAPA Position Paper on WMA. Research on Warm Mix Asphalt (WMA) at the Czech Technical University in Prague (CTU) and Technical University of Brno (VUT) have led to the Preliminary national specifications for WMA (TP 238) published by the Czech Ministry of Transport in 2012. This specification is also valid for mastic asphalt placed at lower temperatures than in the past. A few job sites were realised with this type of mastic asphalt (MA) by the company Eurovia. Some experiments with this MA were also carried out by other Czech contractors. The WMA for compacted asphalt layers is used more frequently. Czech divisions of some multinational companies as Skanska and Porr can use this technology if it is demanded. The implementation of WMA in the Czech Republic has been described in a paper on the HAPA Conference on WMA in 2013 [1a]. In 2013 all asphalt layers of the pavement in an important road tunnel in Prague were paved with WMA. The use of WMA in the tunnel was a requirement the Administration. During the paving of the WMA, in October 2013, the emissions in this tunnel were measured by the Transport Research Centre CDV (http://www.cdv.cz/en/). The final report of the emission measurements on a couple of job sites will be published by CDV in 2014. There is also a 3 years research project called “The most effective use of reclaimed asphalt pavement layers for production of new asphalt mixes” (TA02030549) funded by the Technology Agency of the Czech Republic. The final report of this project will be published in 2014. Here the first experimental section was laid on a secondary road in autumn 2013 by the company Froněk. This company has a parallel drum in its mixing plant which permits the addition of 50 % of RAP. The use of WMA (foam technology) enabled them to keep the production temperature at about 130 °C. The mix design was realised in co-operation with CTU. A research project called CESTI started in 2013. One part of it will focus on the further development of WMA and low temperature Mastic Asphalt. Some leading contractors and the CTU Prague and the VUT Brno participate on this project. [1a] Fiedler J., Kašpar J., Valentin J. WMA specifications and experience with this mix type in the Czech Republic, HAPA conference, Hungary, 2013. In Denmark the company NCC is producing WMA using the foamed bitumen technique where the foamed bitumen is created in a patented foam generator. In September 2012, they conducted a study in cooperation with the Danish Road Directorate on motorway 321 at Ulladulla, where they paved a WMA under exactly the same conditions (in the middle of a day-production) as the traditionally produced asphalt. The product was a polymer modified SMA 11 and the temperature was lowered to WMA with approx. 20 °C compared to the traditionally produced asphalt. The materials were examined and the compaction rate was determined. They obtained identical volumetric data and the same adhesion for the WMA and the traditional asphalt. The installation was almost identical and WMA can be easily applied by the paver. The hardening of WMA was slightly lower than the traditional asphalt produced. Based on these studies the remainder of the job was done as WMA and they obtained very satisfactory volumetric data and installation. Since this job NCC has paved WMA for several other jobs, including “GAB II” on the sections Tuse – Vig and Aaby – Middelfart. (GAB II is a base course mixture. It is a mix with a 32 mm grade and a high sand content (~ 65%) in which a 16/32 fraction of alluvial aggregates is added). “The given USIRF recommends the systematic use of warm mix asphalt, except in special cases; such cases with specific technical constraints or in case of a motivated refusal of the road authority. The USIRF reminds that the stimulation of the use of warm mix asphalt is one of the objectives of the voluntary agreement of actors in design, construction and maintenance of road infrastructure, road and urban public space signed in March 25, 2009. All techniques to decrease the mixing temperature are used in France and the different studies performed show that the technical specifications (mechanical performances of the asphalt concrete) are achieved whatever the process used. Finally, more and more often, WMA are produced and used with Reclaimed Asphalt, this giving a better environmental assessment. In 2010 the Asphalt Producer Association in Norway (FAV) initiated a new project called Low Temperature Asphalt “LTA-2011” to study the consequence for the asphalt workers’ health and the asphalt quality, by doing 11 trial sections with 6 different technics. The production temperature was decreased by 30 °C. On each site also a reference section with ordinary HMA was established. No differences in quality for WMA versus HMA pavement regarding air voids, evenness and rutting. In 2012 the Norwegian Labor Inspection Authority wanted to accelerate the use of Warm Mix asphalt. To achieve this, the Road Administration in Norway has rewarded the contractors with a bonus of €4/ton, when produced by at least 25 oC less than conventional production, assuming the same quality requirements.This was the case in 2013 and is the case in 2014. By the end of 2013, 3 contractors (on 16 different plants) have produced 210.000 tons of Warm Mix Asphalt. In Norway the asphalt industry takes it responsibility for improving the working environment and responds to the IARC recommendations to lower the production temperature, by promoting WMA in collaboration with the Norwegian Road Administration. 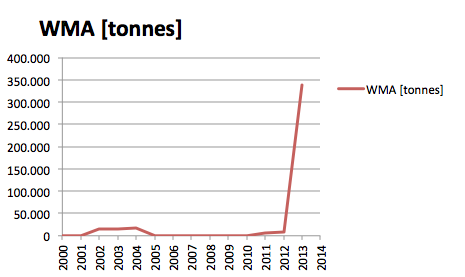 In 2013 they produced about 145 000 tonnes of Warm Mix Asphalt in Sweden. This was produced by using the KGO-method; a kind of WMA developed by Karl-Gunnar Olsson. They were not using foaming or additives in 2013 in Sweden. (With the KGO (Karl-Gunnar Ohlson) method, the coarse fractions of the aggregate mix are initially coated with the bitumen. The fine aggregates, filler and sand, are added afterwards. This is supposed to result in an asphalt mix with better compacting properties so that the asphalt mix can be produced, laid and compacted at a lower temperature level). In Turkey the Technical Specifications for Highways contain provisions for dealing with mixtures with WMA additives, subjected to demonstration of equivalent performance. Until now there is no field experience on highways. There is a research project to develop Warm Mix Asphalt production technology conducted by the General Directorate of Highways and the Scientific and Technological Research Council. The study will be finalised by the end of 2015. The main purpose is to produce domestic additives for WMA. Additionally, transportation boards of some universities have research studies on additives and also foam asphalt. In Istanbul there are trial sections constructed on urban roads by using with zeolite and wax in 2012. The performance of these sections is quite good as well as conventional asphalt production techniques. In the USA the use of Warm Mix Asphalt is increasing faster than in Europe. The following table shows the data of 2009 – 2012. Because WMA is produced at a lower temperature than traditional asphalt mixes, it uses less energy to produce, reduces emissions, improves worker safety, and offers construction benefits. 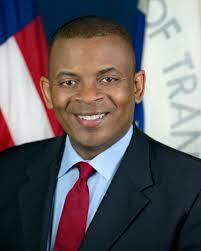 U.S. Secretary of Transportation Anthony Foxx commented in January during the “the Chairman’s Luncheon” of the 2014 Transportation Research Board Annual Meeting that the use of WMA is expected to save $3.6 billion in energy costs alone by 2020. [ … ] I know that in your sessions you’ve all been talking about this: Warm-Mix Asphalt. Now, we can laugh, but this new kind of asphalt doesn’t have to be heated as hot to pave roads. And while that may sound not that Interesting, the savings are very interesting. By 2020, we’ll save $3.6 billion by using Warm-Mix Asphalt: another example of how Innovation will help us create more capacity. In Switzerland a research project is underway to include war mix technologies in the standards (VSS Planet). 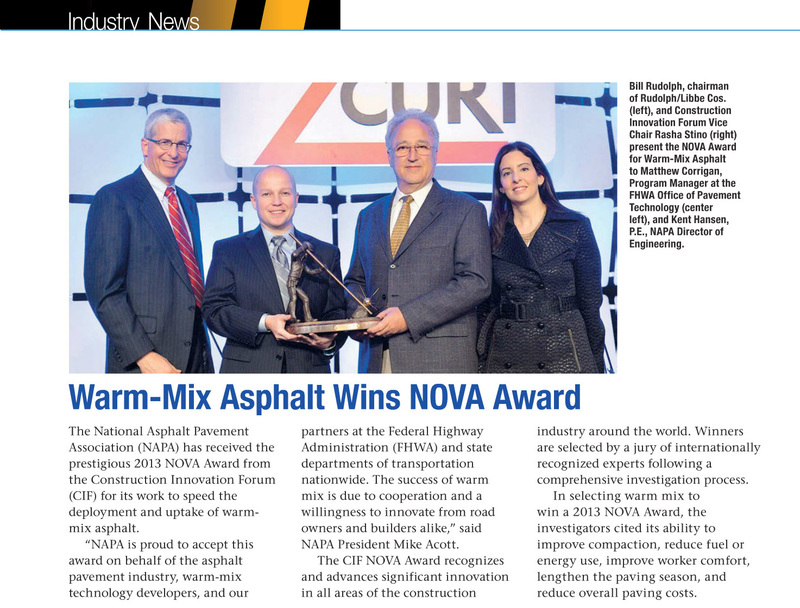 Individual asphalt producers and contractors are propagating warm mix technologies. http://www.lowtemperatureasphalt.info/en/: site created to propagate the use of foam bitumen for low temperature asphalt. http://www.ecoroad.ch/ECOR/: site created by the Swiss asphalt association (SMI) to propagate the use of warm mix technologies in Switzerland. [2.] Review of Overseas Trials of Warm Mix Asphalt Pavements and Current Usage by Austroads Members; AUSTROADS TECHNICAL REPORT; AP-T215-12; November 2012; ISBN 978-1-921991-57-8; Australia. More information and literature references can also be found in the EAPA Position Paper “The use of Warm Mix Asphalt” which can be downloaded by clicking here.